Tom Duncan at his 50th Celebrations, in Holy Trinity. The Chorus began its life in 1963 under the baton of Tom Duncan as the Holy Trinity Augmented Choir, drawing on town and university, both students and staff, for its membership. In 1977, in conjunction with the Scottish Chamber Orchestra under the leadership of John Tunnell, it was renamed "The St Andrews Chorus" and embarked on a journey of music making. It performed a major choral work each year for thirteen years as part of the SCO's subscription series, beginning with Bach's Mass in B Minor in March 1978. From 1991 until 2005 the Chorus was supported admirably by the Heisenberg Ensemble under the inspiring leadership of Gillian Craig. 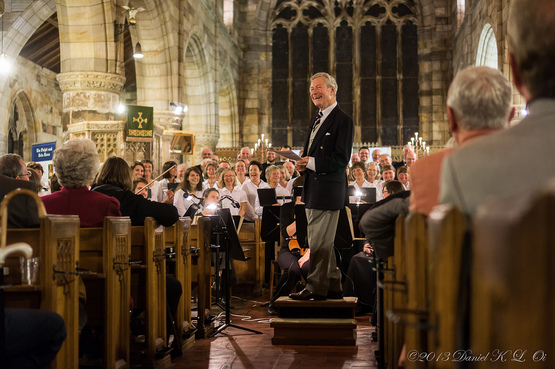 When Tom decided in 1994 to retire from conducting the choir, it was reconstituted in 1995 more formally as a Choral Society, with membership of, and some support from, the National Federation of Musical Societies (now known as Making Music). John Grundy became its conductor, and in 1996 Tom Duncan was elected Honorary President, in gratitude for his service. Another former conductor, Gillian Craig, was elected an Honorary Vice-president at the AGM in 1997. Stephen Doughty trained the Chorus expertly for five years from October 2001. During this period , Valerie Greenaway was our excellent rehearsal pianist. For 3 years from autumn 2006, Edward Caswell was Musical Director. He developed a warm relationship with the Chorus and trained their voices in new ways using his skills as a professional singer. Between 2006 and 2016 Marilyn Boulton was our outstanding rehearsal accompanist. She has now been succeeded by Walter Blair and Andrew Macintosh. In autumn 2009 we were delighted to welcome Michael Downes as Musical Director. In the Courier's "Impact 100", click on the pdf, below, to see how he has inspired us, challenged us and changed our world (Courier edition Wednesday, 10th December 2014). The logo of the Chorus was designed in 1996 by Jack Platford.